Anyone who has attended a workshop or seminar on communication skills will be familiar with the term “active listening”. 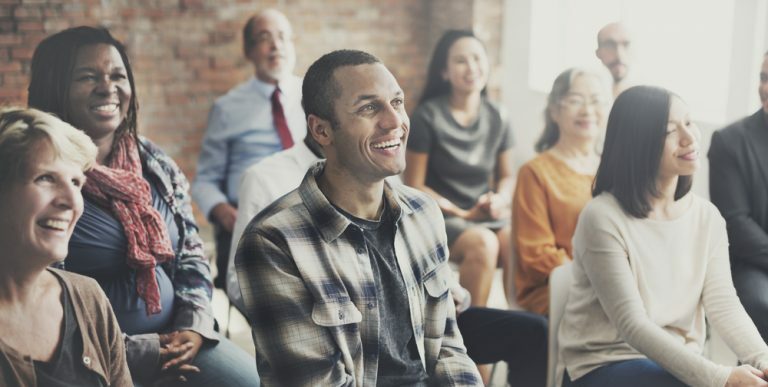 To most of us, this means completely immersing yourself in a conversation by focusing on the speaker and actively listening by performing timely nods, eyebrow raises, hand gestures and mumbled phrases like ‘mmmm’, ‘aha’ and ‘totally!’. So, thinking back to your most recent professional conversation, one that you consciously immersed yourself in ‘active’ listening, did you notice how much energy and effort this took? Did you notice the self-talk inside your head reminding yourself to stay focused? Did you find yourself going on autopilot to outwardly ‘seem’ attentive while rehearsing your next comment or drifting off into your surroundings? I have come to the conclusion recently, that ‘active listening’ is actually a term that actively invites you, as the receiver in a conversation, NOT to be present. You end up so busy ensuring you remain active, that you are in fact not present. Seems obvious doesn’t it? Whether you are speaking to someone face to face, via a virtual platform or even over the phone the focal point must be the speaker. Listen to their voice, their words, the pace of their speech, their inflections and intonations and the energy behind their words. Listening means hearing beyond the spoken words and hearing what is not spoken. Without making judgments on the words spoken, we listen out for the way the words are being delivered. Is the person communicating uncertainty through the staggered cadence of their words? Are they using terms such as ‘I might….I could…..maybe…’ when stating they will do something? What does this convey? What are they truly implying? What do they want to say but won’t or can’t? How is their energy behind what they are saying? Does it match? Does body language reveal more? Taking in the whole person beyond just their words will paint the whole picture, rather than just give you a sketch. This is tricky and harder than it sounds. We love to outplay, outwit and outperform our peers and prove our worth. We keenly jump in with our own 2 cents at the nearest opportunity. The speaker takes a breath, needs to cough, sips a coffee – and bang, there we are interjecting with our own intellectual breakthrough. As a result, we haven’t in fact heard a thing! Remaining silent means staying quiet until the speaker has fully finished speaking, and even a little beyond that. Remember the 70-30 rule; listen 70% of the time and speak 30% of the time. This requires letting go of the assumptions we readily make as we think we know what the person is going to say. It means letting go of our innate habit of finishing their sentence. It means taking a back seat until the batten is fully passed into our hand. It means letting go of the super-ego for just a little while. We are only able to activate our listening if we are fully ‘there’ with the person. Remember back to your last social function, one you attended with a room full of unknown guests? You were on your own, feeling a little awkward, but realised that unless you made the effort to make conversation and engage with people, the night was going to be a dud. You made eye contact with someone and started up a pleasant conversation that started with lame comments about the weather and then progressed into questions to find out more about the person. Occasionally a question is answered and not reciprocated. The conversation peters out into nowhere land. But your best engagements are those where you truly connect with the other person and find yourself delving deeper into understanding the who, what, how, when and where of the person. Wiping aside our judgments, preconceived notions, assumptions, perceptions and templates of thinking and seeing our clients (or the speaker) as if we are meeting them for the first time means that we start with a clean slate, a blank piece of paper, and we allow the current conversation to fill the space. Activated listening leads to activated conversations. Through fully attending to the person who is speaking, we can pick up on the language and words that they are using. Applying the principle that people feel most comfortable with those they can relate to, or more simply, those most like themselves, if we then mirror-back the language and words that they have used, you will create a bridge of familiarity and respect. People who feel respected and comfortable will connect more, share more and be more open and vulnerable. For example, if someone says to you ‘the work is too hard’ and you come back with ‘you can’t manage the work’ you may be completely off track. Instead, asking ‘what do you mean by too hard?’, the person feels heard. Creating the opportunity for activated listening requires a few ingredients; firstly, time, secondly, energy and thirdly generosity. Conversations can occur at opportune or inopportune times. We have all had moments when we might be dashing out the door to catch the bus and some well-intentioned person slows us with chatter about the weekend’s football game. Or, our client or colleague is working to deadlines and we wonder why they are short with us. Choosing the right moments to engage in meaningful conversations is part of activated listening. Letting the person know that time is needed to engage can be a great starting point. Then, during this time patience is a must. It’s certainly not my strong point all of the time and this is common for fast thinking and direct communicators. I can ask a question to a verbose client or colleague and then be on the receiving end of a convoluted, drawn out and detailed response that doesn’t deliver what I’d hoped for or I simply don’t have the time for. It takes energy and generosity to remain activated. Give yourself a chance by communicating your readiness to the person and ensuring you have the platform for the time, energy and generosity to occur. Part of being activated is allowing yourself the best opportunity to commit to the conversation. If you can’t commit right now, ensure you clearly communicate your desire to fully commit to your client or colleague. Activated listening can lead to more effective conversations and deeper learning between you and your clients and colleagues. Challenging yourself to apply some or all of the 5 steps to activated listening will lead to more meaningful and fulfilling engagements.